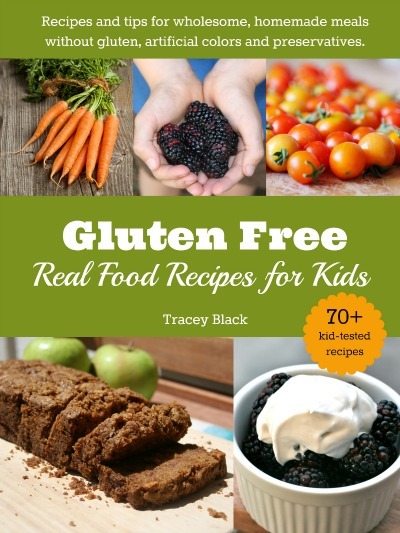 You are going to love this fabulous cookbook from Tracey Black, Gluten Free Real Food Recipes for Kids! Actually, even if you aren’t gluten-free you will still love it! Tracey has kindly let me share one of her yummy recipes with you and she is giving away two copies of her cookbook. But let’s talk about the food first. the zucchini to get the water out. 2. Heat a large frypan (cast iron is good) to medium and add 1 tablespoon of coconut oil. Cook the onions until soft and remove from heat. Return frypan to stovetop and heat remaining coconut oil. 3. In a medium-sized bowl, add egg, flour, garlic, salt and pepper. Mix well. 4. Add zucchini, onion and cheese to egg and flour mixture. Mix well. 5. Scoop a spoonful of mixture and place in frypan. Repeat as needed to fill frypan with about 2 inches between each hash brown. 7. Repeat steps 5 and 6 until all hash browns are cooked. Tracey’s cookbook, Gluten Free – Real Food Recipes for Kids is fast becoming a family favourite around here. The kids are keen for me to make the Almond Butter Choc Chip Cookies, but I want to try out the Probiotic Ranch Dressing (how cool)! There are over 70 family friendly recipes. No artificial ingredients or processed foods are used. Tracey has kid-tested all the recipes on her own three boys! Recipes include kid-favourites such as Pizza and Chicken Fingers – as well as more modern cuisine such as Quinoa, Feta and Tomato Salad and GrainFree Fish Tacos. All the recipes are gluten free and there are many vegan, vegetarian, grain-free, dairy-free and egg-free options. Tracey has included everything from snacks to drinks, breakfasts, main meals, lunchbox ideas and sweet treats. 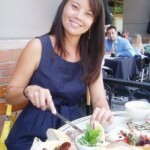 But it’s not all just recipes, Tracey has some great information for you as well. Discover which foods and ingredients are toxic and should be avoided – as well as real foods your family needs for real nourishment. There’s also an extensive section on how to decode food labels, all about real food nutrition, kitchen staples and tips to get kids to become better eaters. This giveaway has now closed. The lucky winners are Sarah Titmus and Kate Dillon. Would you like to win one of two copies of Gluten Free, Real Food Recipes for Kids? ♥ Comment on this blog post, telling me the first thing you would make from the cookbook if you won! I would love to try the gluten free choc chip cookies – bet they wouldn’t last long here!!! Oh I simply would love this book! What is your favourite recipe out of it so far? Deliciously Moist Banana Bread – the best and most popular way to be rid of those over ripe bananas. I would make the Hummus with fresh cut vegetables. Deliciously Moist Banana Bread for sure!! Banana bread..my fac comfort food. I would try the chicken fingers, swiftly followed by the almond butter choc chip cookies! This book looks fantastic, full of useful information! Thanks to you and Tracey for the opportunity to win it – we would make very good use of it (we’re in the process of cutting out gluten for health reasons). That banana bread looks delicious. I haven’t found a gluten free banana bread recipe that I really love yet so that would be the first one I would try. I am going to make those hash browns this week! I would make the fish tacos! This book sounds awesome! Almond butter choc chip cookies sound good to me! I’m struggling to make up my mind what I would cook 1st. Probably a batch of the Almond Butter choc chip cookies for dessert after the quinoa feta and tomato salad. It all sounds so yum. That’s a hard one, so many choices. The Herb & Cheese Pizza Crust sounds really yum. I absolutely love home made pizza. I’m making the zucchini hash browns this week!!! Thankyou! Moist Banana Bread, my little one would love it! The Almond Butter Chocolate Chip Cookies have my name on them. Definitely the most banana bread. It is a huge favourite in our family. It looks so delicious. This book looks amazing! The first I would make for my son would be chicken fingers! He eats his veggies easily but we struggle a bit with meat and chicken especially if it’s dry. I would love to try the Banana Bread as my backyard bananas are ripening quickly, the zuchini hash browns sound amazing. I missed the recipe for my homegrown zuchs but will have to try with some storebought ones. Any delicious snd nutricious food will do. I would cook the herb and cheese pizza crust- what toddler doesn’t like pizza? My 2 year old loves it but I really try to make a healthy version of it for him and this book would help enormously with that. I can’t wait to try the zucchini hash browns either- thanks for the recipe. Deliciously Moist Banana Bread would be my first choice to make. Yummy! This book sounds great & would be very useful as my daughter is gluten free. Bacon wrapped Dates. Sounds delish. My mouth is watering. Ooooooh! Fish Tacos! Sounds obscenely good. I would love to try this and every thing else! YUM! I’d be making the Probiotic Ranch Dressing! How inventive! But I’d be reading this book front to back as I’m absolutely trying to rid our food of any nasties & reading labels everything we purchase outside of fresh food is becoming very challenging! The grain-free fish tacos sound divine!! I would make something egg free, as my daughter has this allergy and I am always trying to find good recepies. I would also like to learn how to sprout lentils…etc. 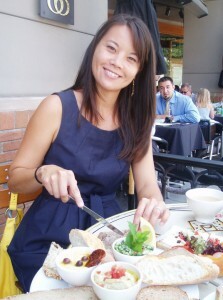 I am always looking for more gluten free (healthy!) lunchbox treats for our girls! Oooh – I would love to win this book 🙂 I am a new vegetarian and have many friends with special needs so this info would be really helpful! I haven’t baked in years – might give those cookies a try!! Fish Tacos YUM, I would definitely like to try those first and I know my kids would love them. 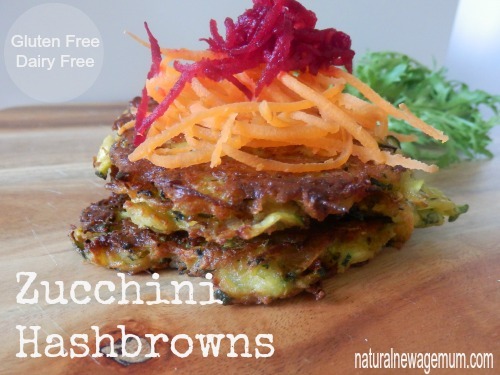 I would have to go the zucchini hash browns – they sound so special and moreish! I have suspected a wheat allergy within my body for many years now and the health seems to indicate it! Especially when I read the list of symptoms! I would love to win this! I would like to try to get the kiddies to eat salad! Quinoa, tomato & feta sounds good. Mmmmm…hummus and fresh cut veggies! Lucky if the kids would get any! The choc chip cookies and the hash browns. Looks like there are lots of yummy things in the book. I’m loving quinoa at the moment, so I would have to try the quinoa, feta, tomato salad! My family loves Banana Bread. It looks delicious, so that would be first. The banana bread – the traditional recipe is very popular with my little girls, so it would be great to offer them a healthier version! The first thing I’d make is the Herb and Cheese Pizza Crust. Mr2 is awaiting results of coeliac’s disease testing, and if it’s positive I’ll be getting Mr3 and Mr5 tested too. Then they will all be going GF (I already am). And a yummy GF pizza sounds like it’ll be just the thing to show them GF food is good, nothing to be scared of and just like the stuff they eat now, only better because it won’t make them feel yuck!! I adore banana bread so my first recipe would be the ‘Deliciously Moist Banana Bread’ because I would love a GF version. the herb and cheese pizza crust looks delicious! The Almond Butter Choc Chip Cookies, love a little sweet treat with my cuppa and the kids would love them in their lunchboxes. The pizza fingers and this book sounds fab! I would make the featured recipe, Zucchini Hash Browns, because my neighbour is growing heaps of them at the moment and giving his excess to me. The herb and cheese pizza crust looks awesome! The lucky winners are Sarah and Kate! Please check your emails (including the spam folder!) Congratulations ladies! Hello, I tried these out and they are great! I changed the recipe a bit to suit us, i.e. making them fructose-friendly (no onion/garlic) and gluten-free. I’ve credited you in my post too, thanks!